Combines have been monitoring yield since the mid-nineties. Back then, forage yield monitoring was still in development. However, yield monitors for forage harvesters have made great progress in the last ten years. We are familiar with the importance of calibrating the yield monitors on combines and now need to pay similar attention to forage harvesters. To build a yield map, your harvester’s electronics combine mass-flow (throughput), harvested width, speed and location. Harvested width, speed and location are available from the machine’s global navigation satellite system (GNSS). Throughput on a forage harvester is commonly measured indirectly as feedroll displacement (Figure 1). The concept is that as the harvester engages higher yielding crop, more mass enters the feedrolls, causing them to separate to accommodate the increased volume. Researchers have correlated this displacement to the total mass of the crop. Because throughput is not directly measured, a calibration that builds a relationship between feedroll displacement and throughput is critical. Calibration begins with ensuring the feedrolls start at the proper zero position. The feedroll position can move off the zero position when feedroll spring tension or mounting position is changed, or when crop builds up under the feedroll down stops. Consult your operator’s manual for specific points to check on your machine and for specific steps for the zero point calibration. Also, some machines have a response threshold or minimum feedroll displacement, which will trigger throughput monitoring. This is much like the header height shut-off on combines. Corn silage may have a higher shut-off threshold than alfalfa or grass. Be sure to check that your machine is set up for the crop you intend to harvest. Once the zero point and the response threshold are established, the system must be calibrated to match the volume (displacement) to the mass of the particular crop that you are harvesting. Crop yield, moisture and species as well as feedroll spring tension and length of cut can have a significant effect on the yield prediction. Therefore, it is important to start the calibration process in a representative, uniform area of the field. Additionally, it is important to harvest at the speed you expect to operate. This insures the calibration point is as close to the typical operating conditions as possible. Generally, machines have a calibration “wizard” or step-by-step procedure to follow. As usual, make sure the container you are loading has a recent empty weight and that it is completely empty. Also, harvest a full load; however, in order to obtain an accurate calibration factor, do not overfill the container, as crop could be lost in transit to the scale. At this time, most machines allow the operator to resume harvest until the load weight can be entered into the calibration wizard. Once this weight is available, a calibration factor is calculated that relates the container weight to the calculated volume during the calibration run, based on feedroll displacement and time to fill the container. This factor now adjusts yield data recorded from this point forward. To accommodate varying field conditions, it is recommended that the calibration factor be adjusted at least once per day or when a noticeable change in harvesting conditions occurs. The next step is setting up your moisture sensor for an accurate reading. 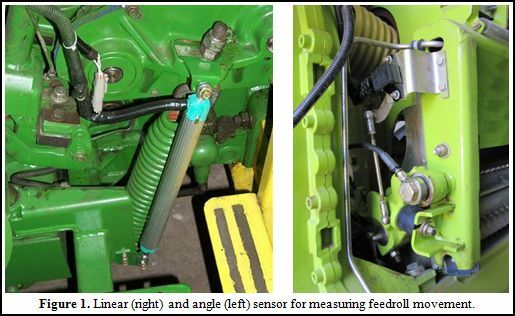 There are two different types of technologies utilized on today’s forage harvesters including capacitance sensor and near infra-red reflectance spectrometer. Both sensors require specific maintenance to work properly. However, both need to be cleaned of material buildup, especially gummy material, to work properly. This often can be remedied by ensuring the sensor is properly adjusted to engage the crop stream or by cleaning with window cleaner and a rag. Also, both require a call to the dealership if moisture prediction is significantly off. The capacitance sensor accuracy can also be improved by entering a crop density. This process involves compressing harvested crop into a specific volume container and measuring the weight (density is the weight of crop per volume). Please follow your operator’s manual and harvester’s wizard for specific instructions. For the NIR sensor, make sure your sensor has the latest calibrations from the manufacturer. You can either visit their support website or contact your dealership. It is also important to make sure the sensor’s lens is free of any scratches or excessive wear and is properly adjusted to interact with the harvester’s crop stream. Contact your dealer if you suspect your lens may need replacement as they can assess the lens with a wavelength standard. With some attention to the details, you will have a harvester that should be able to produce yield maps that will allow the same precision management expected in cereal crops. Forage yield maps, coupled with site-specific technologies in application of soil amendments, fertilizers, and pesticides will allow the crop manager to determine the resulting yield response for these management decisions. Yield improvement would not be the only factor increasing profitability as site-specific application of fertilizer and pesticides could lead to lower usage, resulting in lower input costs and environmental impact.